▶❀ Add some educational fun to play time with this Cash Register Toy! The Kid's Toy Cash Register is a great addition to any kid's pretend play toy collection. The Cash Register Toy comes with play money, credit cards, a hand scanner and working cash register! All you do is swipe the card, press the button, and the drawer shoots open to reveal the cash! This Cash Register Toy also comes with a conveyor belt and a basket full of groceries! With this register, kids can pretend to shop at the grocery store! Each set is constructed of durable plastic, and comes with a key to manually lock or unlock the cash drawer. This is a great gift idea for young kids just learning about math and money!The microphone is not functional decorations. ❀ Add some educational fun to play time with this Cash Register Toy! The Kid's Toy Cash Register is a great addition to any kid's pretend play toy collection. 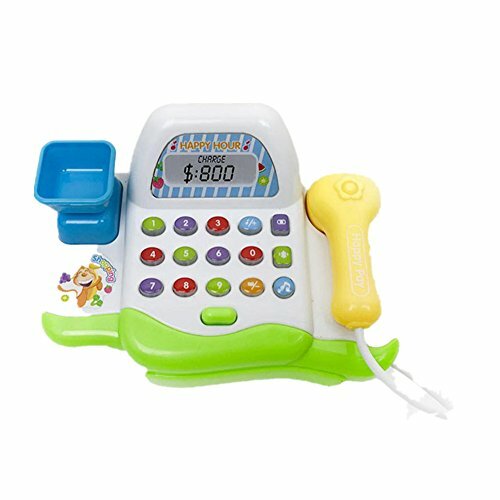 The Cash Register Toy comes with play money, credit cards, a hand scanner and working cash register! All you do is swipe the card, press the button, and the drawer shoots open to reveal the cash! ❀ This Cash Register Toy also comes with a conveyor belt and a basket full of groceries! With this register, kids can pretend to shop at the grocery store! Each set is constructed of durable plastic, and comes with a key to manually lock or unlock the cash drawer. This is a great gift idea for young kids just learning about math and money!The microphone is not functional decorations.